After Margherita’s father steals parsley from the walled garden of the courtesan Selena Leonelli, he is threatened with having both hands cut off, unless he and his wife relinquish their precious little girl. Selena is the famous red-haired muse of the artist Tiziano, first painted by him in 1512 and still inspiring him at the time of his death. She is at the center of Renaissance life in Venice, a world of beauty and danger, seduction and betrayal, love and superstition. Locked away in a tower, Margherita sings in the hope that someone will hear her. One day, a young man does. 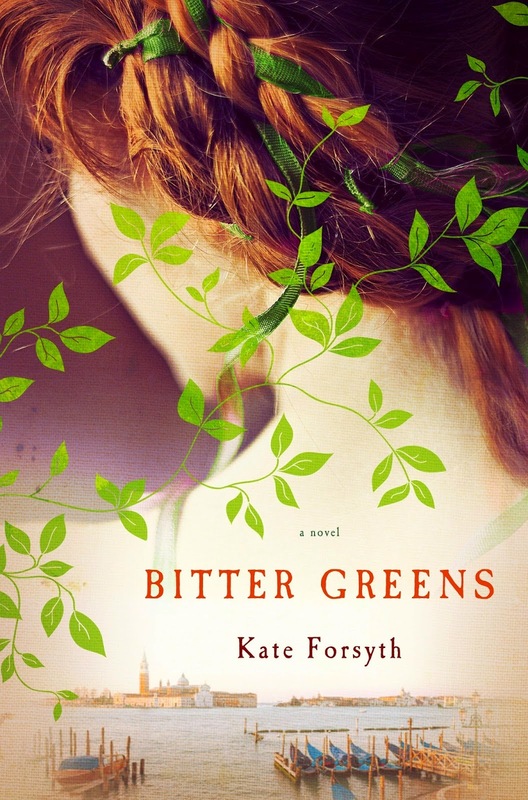 In the novel Bitter Greens, Kate Forsyth has combined historical biographical fiction with the famous fairy tale, Rapunzel, written by Charlotte Rose de Camont. The result is a lush tale that combines the individual stories of three women. In seventeenth century France, Charlotte Rose de Camont de la Force, is banished from the opulence of the royal court and sent to live an austere life of severity in a rigidly ruled convent. There, she meets Sister Seraphina who tells her the story of Margherita (Persinette or Little Parsley) a young girl imprisoned in a tall tower by a witch named La Strega Bella. The novel’s storyline unfolds piece by piece through the voices of these three fascinating characters. The strength of this novel lies in the wonderfully imaginative plot and superbly developed characters. Some scenes are very dark, with each character facing horrendous adversity that enthralls the reader. Some scenes are incredibly warm and heart-warming, filled with romance and success. In between readers can expect a very fast paced story with an ever evolving plot with plenty of twists and turns. Despite the fact that Rapunzel is a fairy tale we are all familiar with, the author’s writing style makes it not only plausible, but very realistic and believable. The historical portions of the story are also vividly depicted and are well-researched. Most appealing is the fact the author does not shy away from extremes – poverty and wealth, innocence and corruption, good and evil, illness and health. Reading this book was a pleasant surprise. A novel written with insight and depth, and immensely entertaining. I’m looking forward to reading more from this author.